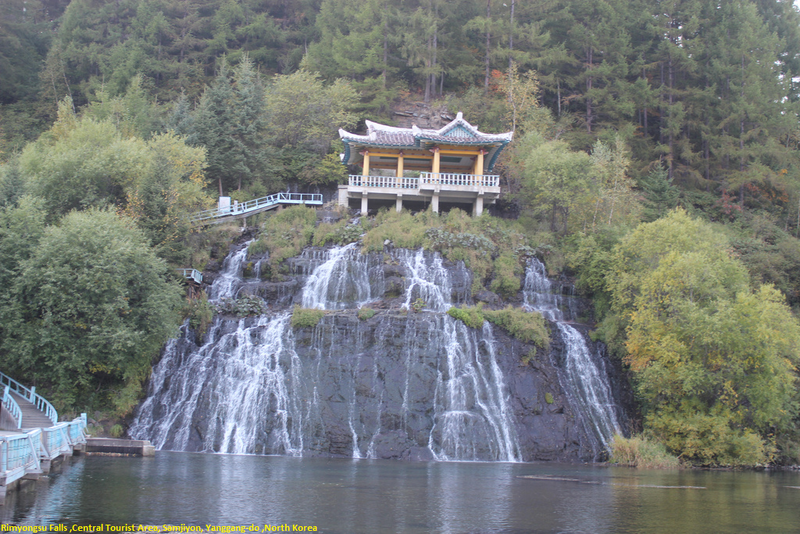 The Rimyongsu Falls, situated in the area of sacred Mt. Paektu nearby Samjiyon. A stunning sight all year round.About 800 meters from Rimyongsu are the beautiful Rimyongsu Falls. The water comes from underground streams and breaks through the basalt rocks. The falls are 4 meters wide and 6 meters high. In wintertime the falls change into ice pillars, a spectacular view. To reach there first you have to find Samjiyon. And from Samjiyon you have to take left turn you will road towards Rimyongsu. When you reach Rimyongsu from here you have to travel 1.3 km more then you reach a point from where you have two roads separated. Now you have to walk to reach the fall. There is another way to reach you have to find Pochon from there you have to follow the road towards Samjiyon and after travelling 34.1 km you will find a road towards Rimyongsu.You have to move on this road after 6 km you will find the Rimyongsu falls.